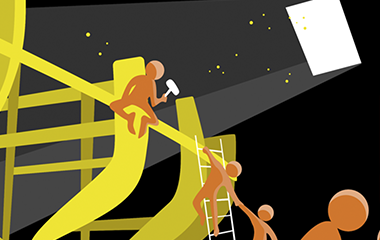 What's the difference between target operating model and organizational design? 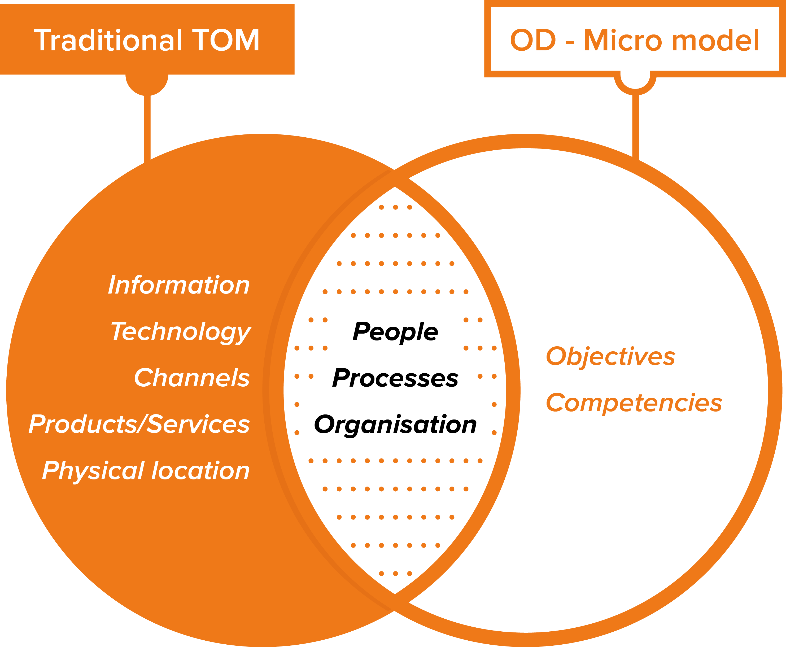 I am often asked the question, “What is the difference between Target Operating Model (TOM) and Organisational Design (OD)?” I tend to find that while TOM is generally well-understood, there is a lack of consensus among academics, HR practitioners, HR generalists and those outside the HR function when it comes to the working definition of OD. For example, many people still think of OD as a simple exercise of changing the structure of an org chart. It is so much more than that! Why is it vital to be crystal-clear about their definitions and key elements? Rhetoric pedantry aside, confusion in terminology and scope of the two terms can deny the actual value they promise to deliver. What is Target Operating Model? By and large, there is consistency and structure on the definition of TOM in the business context. KPMG, IBM, and Deloitte define TOM as a comprehensive operating model or design that allows the execution of a company’s corporate strategy. In other words, TOM is the skeleton of how a business will deliver its business model in relation to its value proposition and profit model. Breaking down a company’s current operating model to these components makes it easier for business professionals to assess the maturity of their company’s current operation, define their desired future state, and design the roadmap to get to this target state. This makes TOM both a noun and a verb – a desired future state and the process of getting there. I think about Organisation Design as the question: How do we organise my work and resources (people) so that we maximise the probability of hitting and exceeding our goals in order to execute the strategy and achieve the organisation’s vision. While TOM only provides a skeleton or a high-level representation of a company’s business model, OD, as illustrated in Figure 2 and Figure 3, deconstructs the model into micro level design to include goals and objectives as well as competencies, roles, and right sizing, and focuses on the granular level of how to make it real. Like the traditional TOM, this information can be useful to design a salesforce that effectively targets a customer segment for a particular product or service. So OD should be thought of as a part of TOM and must be carried out simultaneously during any transformation project in relation to the remaining six layers of TOM. The diagram below shows the interconnection of an organisation’s elements at a micro-level. In practicing OD, micro design is articulated after the strategic macro design. But getting the right design means nothing, if we don’t execute it well. This is why, as I emphasised in a recent article, “Think your organisation is effective? Get your fitness tracker on!” the last stage of OD, making it real is pivotal. Too much confusion has been caused by professionals using both terms in a transformation project. In the academic context, TOM and OD are different pathways with the same end goal: to get an organisation to its ‘to-be’ state. Personally, I would recommend you to choose one term and use it consistently across the organisation. Regardless of which, be sure to drill down to micro details and define all elements of the organisational system so that your macro vision is implementable and sustainable. The ideal transformation journey would address all 11 elements shown on Figure 1. But in practice, you cannot do everything at once as you will put your organisation on cognitive overload and time pressure. You need to decide which of the 11 elements you need to prioritise, in what order and what level of detail. In my next blog series, I will discuss the dangers of being absorbed in org-charting and neglecting micro-design. In your experiences, what do you see as the differences in TOM and OD? Please comment below. Deloitte (2009) Managing Complex Transformations: Achieving Excellence. Available at: http://www2.deloitte.com/content/dam/Deloitte/global/Documents/Energy-and-Resources/dttl-er-managingcomplextransformations-08082013.pdf (Accessed: 27 November 2015). IBM (2012) Target operating model accelerator. Available at: http://www-01.ibm.com/common/ssi/cgi-bin/ssialias?htmlfid=GBD03161USEN&appname=wwwsearch (Accessed: 27 November 2015).